Power Ethernet reveals the PE Socket, a new Powerline networking product that has been integrated directly into an electrical socket. The PE Socket features one power socket and four Ethernet network ports in a single wall outlet. The product is currently only available in the UK, and pricing is pretty high at £144. British technology start-up, Power Ethernet, has launched the ‘PE Socket’, the first product to integrate Powerline networking technology directly into an electrical socket. The PE Socket provides a simple and professional way of specifying high-speed data network connectivity throughout a building by using electrical cabling. The ‘PE Socket’ is available from leading electrical resellers including CPC and Rapid Electronics. Based on the HomePlug AV standard for Powerline networking, Power Ethernet’s all-in-one PE Socket combines four Ethernet network ports, a fully-managed network switch and filtered power socket into a single device. It fits a UK Standard 35mm double gang metal back box and uses a building’s electrical wiring to create a high-speed and secure data network for connecting computers, Voice over IP phones, Internet-connected TVs and digital signage, home automation and entertainment systems, building management systems, CCTV cameras and other Ethernet connected-devices. Power Ethernet’s PE Socket is unique in integrating Powerline into the electrical fabric of a building and its sockets. It’s a professionally engineered, reliable Powerline solution which has been aesthetically designed to ensure that the sockets can be installed in the most prominent of positions. This enables the creation of a high speed network without the need and the disruption of running specialised cabling. In Greenfield sites, the Power Ethernet system removes the cost of specifying and installing additional cabling to provide network connectivity. In Brownfield sites, it also removes the costs of making good the installation of additional data cabling and reduces disruption by using existing electrical cabling. It can be used as a complete, backbone network for residential buildings, providing Internet and data connectivity for devices and home automation systems. In commercial buildings it can be used as a simple way of extending existing networks to accommodate demand for new device connections or creating sub-networks to support deployments of IP-based phones, CCTV cameras, building management systems or digital signage. 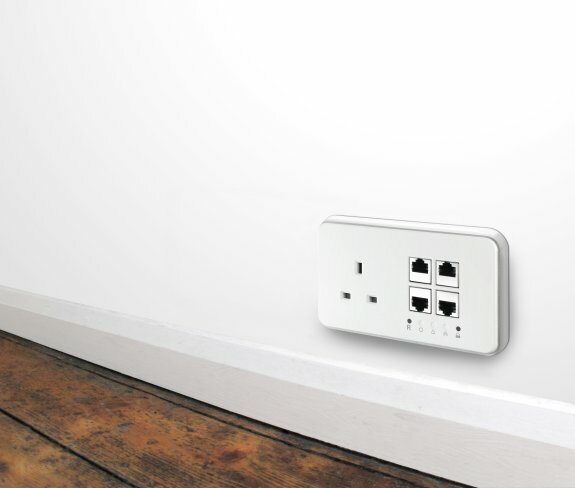 The Power Ethernet socket supports speeds of up to 200Mbps across mains cabling and distances of up to 300 metres between sockets. The filtered power socket is designed to reduce the effect of electrically noisy devices that may be plugged into it in order to provide the highest network rates across the Powerline network. Installing two or more PE Sockets instantly creates a high speed, secure Ethernet network running across the existing electrical mains cabling. More devices and additional rooms can be easily added to the network simply by installing additional PE Sockets so creating a truly flexible, affordable networking solution. 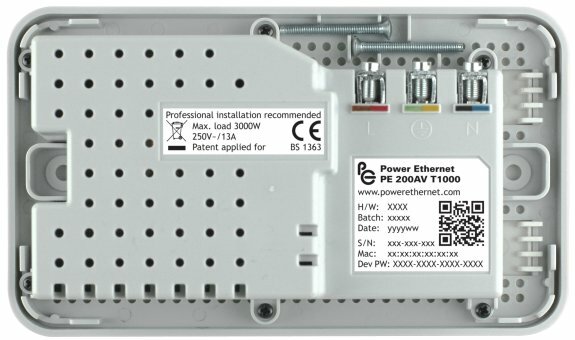 A Power Ethernet network includes the advanced networking features needed for commercial deployments, such as support for voice and video over IP, security (128 bit AES), device prioritisation (Quality of Service) and network segmentation (virtual LANs). With a fully-managed network switch on each socket, the Power Ethernet system integrates easily with existing enterprise networks.